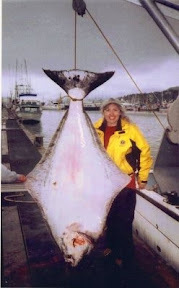 Have I told you about the time I helped catch this 300 pound halibut? Be in a Tomato Fight. that's one of my boyfriends bucket list items to catch a Halibut ..... i made a post of my bucket list - i think it's an evolution and keeps growing and growing! - i can go on for days ..
lol - love that one. my bucket list contains too many things that will never happen. it's more of my daydream list than a bucket list. cruise to alaska, honeymoon to hawaii, totally paid for car (that's not a bucket of junk), not thinking i'll have to work until the day they pull me out of here on a stretcher. those kinds of things. hahaha! still trying to figure a way to see that concert in february but it's looking more and more doubtful since we're also moving and i need any extra $$ i might have for that. i'll live - and i'll get over it. but i can yearn for a while, right? Wow, that is some fish! I have a pretty long bucket list, filled with things related to travel, career, family and more. My current goal is to of course fulfill my dream of writing a novel. You know, I'm not sure I have an official bucket list. Some things float around in my head but it's always changing. Some day Hubby and I are going to drive up the Alaska Highway. I'm looking forward to that. You did a great job landing that halibut. Good for you. haha, i want to be in a tomato fight too! WOW, now that is some fish. A tomato fight....now that's a good one. I guess (for some reason) I never thought the things I "dreamed of" would ever remotely come true. I guess I need to rethink that. WOW, what a fish!!! That's awesome -- and definitely on my list! My goodness, look at the size of that fish!!! !